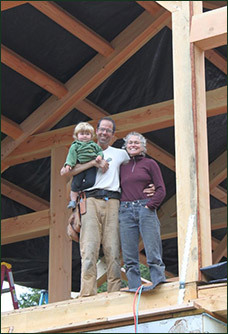 Chris “Flash” Clark and Katharine Bill moved to the Methow Valley in 1996, and have been actively involved in sustainable building projects in the Methow Valley for the past 17 years. Flash is the master-builder and craftsman of Tall Timber. He has over 20 years of carpentry and timber-framing experience, and also has a passion for using local and salvaged materials whenever possible. Katharine is the behind-the-scenes facilitator for project management, billing, materials sourcing, native landscaping, etc. Katharine also wrote the first and edited the second addition of the Methow Conservancy’s Good Neighbor Handbook, and has 15 years of conservation project management experience in the Methow Valley. Together, Flash and Katharine share a passion for buildings that work in the Methow Valley climate, and that customers love for many years to come. Their complimentary skills bring a wealth of experience and attention to detail to every project. Tall Timber also hires employees to help with larger projects, and Flash occasionally works in tandem with other contractors, as necessary depending on the project size.